Background: Overweight and obesity, initially thought to be the problem of the developed countries, are rapidly rising in the developing countries constituting a high proportion of nutritional problems in these countries. Several factors, including changing lifestyle and improved economic power, are believed to contribute to this trend. This pattern if unchecked is known to lead to several medical complications. We thus aim to assess and compare the prevalence of overweight/obesity among primary school pupils from the public and private schools as well as determine factors contributing to the rising trend. Materials and Methods: Four hundred and twenty primary school children from public and private schools were selected using multistage stratified random sampling. Relevant information was obtained using a questionnaire, and anthropometric indices were recorded. Data obtained were analyzed using EPI INFO version 3.5.1. and frequencies were compared using Chi-square. Results: Seventy-three (17.4%) of the 420 pupils studied were found to be overweight/obese. Pupils from private school accounted for the majority of these cases with 28 (13.3%) and 29 (13.8%) of them being overweight and obese, respectively. High socioeconomic class and consumption of energy-dense diet were significantly associated with high prevalence of overweight/obesity (P < 0.001). In contrast, regular physical activity was significantly associated with low prevalence (P < 0.001). Conclusion and Recommendations: Prevalence of overweight/obesity among primary school pupils is quite high in Lagos, Nigeria. High socioeconomic class, consumption of energy dense food, and lack of adequate physical activities appear to be major factors contributing to this high prevalence. Introduction of daily school meal and mandatory physical activity in all the schools would go a long way in imbibing healthy eating and lifestyle pattern into these children. Public nutritional education and campaign on the importance of healthy lifestyle and complications associated with overweight and obesity would probably reverse the trend. Recently, overweight thought to be the problem of the developed world is spreading to the developing world. Several studies in Africa and other developing countries have documented an emerging trend of malnutrition with overweight and obesity increasing at an alarming rate in comparison to undernutrition. , However, in these developing countries, contrary to the finding in the USA, overweight and obesity appear to be more common among the high socioeconomic class. ,, The effect of urbanization and the associated change in lifestyle have been shown to contribute immensely to the current increasing trend of malnutrition in the developing countries. , However, children of low socioeconomic status from such urban centers remain significantly associated with undernutrition rather than over nutrition,  further underscoring the central role of socioeconomic status in malnutrition. The increasing rate of obesity means that obesity-related chronic diseases are likely to become common among the children. Being overweight is known to significantly increase the risk of asthma, type 2 diabetes, gallstone, heart disease, high blood pressure, and several other diseases. This will further impose a great challenge to the already overburdened health care system in the developing countries. We thus aim to assess and compare the prevalence of overweight/obesity among primary school pupils attending public and private schools, in Ikeja Local Government Area (LGA) of Lagos and to identify common factors associated with overweight/obesity. The information generated would be useful in guiding the concerned authorities in designing appropriate interventions in the various schools. The study was carried out in public and private primary schools in Ikeja LGA of Lagos State Nigeria. Ikeja is the capital city of Lagos state, the most populated and urbanized state in Nigeria with over 10 million residents. There are 114 registered private primary schools and 32 public primary schools in Ikeja LGA. It is a cross-sectional survey. This consists of pupils in public and private primary schools in Ikeja LGA. The values for P1 and P2 were taken from a previous study. A minimum sample size of 146 pupils for each type of school was obtained, but to increase the power of the observation, 210 pupils were studied from each type of school as resources allowed. Multistage stratified random sampling was used. Based on the numbers of schools, three private and two public primary schools were selected. Participants were selected by simple random sampling method using the class register as a template in each of the classes of the schools selected. Children whose parents refused consent, children with obvious skeletal deformity, and those with known chronic medical conditions such as chronic renal failure and heart disease were excluded. Ethical clearance was sought and obtained from the Ikeja LGA Education Authority. The head teachers of the selected schools also gave well-informed expressive approval after receiving appropriate information. All the selected pupils were given consent form and introductory note to the study to their parents for their signature or thumbprint. There was no consequence for the pupil if he or she refused to participate or parents refused consent. Data obtained were treated with confidentiality and only for the purpose of this research. A structured questionnaire was used in the collection of relevant information required to meet the objective of the study. All the participating pupils were interviewed at school and sent home with the section of the questionnaire to be completed by their parents and were returned the following day. Information obtained included sociodemographic data such as age, gender, parents' occupation, average monthly income, and educational attainment. Information on dietary intake includes type of diet, frequency, and 24 h dietary recall. Involvement in exercise and physical activity were also sought. Socioeconomic status was assessed using the model of Ogunlesi et al.,  whereas the dietary pattern of the child was assessed using a pretested food frequency questionnaire. Weight was measured in kilogram to one decimal place using a bathroom weighing scale with sensitivity of 0.5 kg. The weighing scale was adjusted to the zero reading before each weighing, and a standard 20 kg weight was used to revalidate the scale at regular intervals and adjustment made as required. Height was measured in meters to two decimal places using a stadiometer. Nutritional status was determined using body mass index (BMI) percentile in accordance with the National Centre for Health Statistics/Center for Disease Control and Prevention. BMI for age of ≥95 th centile is classified as obesity, ≥85 th to <95 th centile as overweight, ≥5 th to <85 th as normal and <5 th centile as underweight. The data obtained were entered into and analyzed using EPI INFO version 3.5.1 (developed by Centers for Disease control and Prevention (CDC), Atlanta, Georgia (USA)). Tables were used in data presentation. Chi-square and Fisher's exact test were used in comparing frequencies. A total of 420 children were studied, 210 pupils from each school type. The children from the private schools were younger with a mean age of 7.7 ± 1.9 years as against 10.3 ± 2.6 years for those in public school (t = 11.58, P 0≤ 0.001). The female pupils were slightly more than the male with M: F ratio ≈ 1:1.1 in both groups. Majority 176 (83.3%) of the pupils from the private schools were of high socioeconomic class whereas those from public schools were predominantly of the middle socioeconomic class (χ2 = 305.34, P ≤ 0.001). 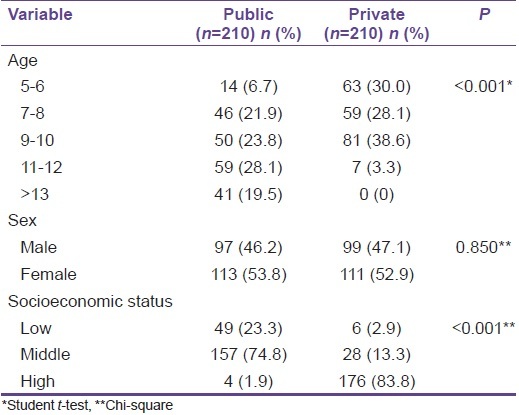 [Table 1] shows the sociodemographic features of the study sample. The dietary pattern among the two study groups was significantly different across all the common food items studied (P ≤ 0.001) [Table 2]. The frequency of daily consumption of all the food items considered were higher among the pupils from private schools except for two locally made beverages (Zobo and Kunu), which had higher daily frequency of consumption among the public school pupils. Regarding extracurricular activity, the pupils in public schools engaged more in physical activity compared to those in private schools. One hundred and thirteen (53.9%) pupils from the public schools trekked daily for a distance of at least one kilometer as against 8 (3.8%) pupils from the private schools. Similarly, 77 (36.7%) pupils from the public schools engaged in competitive sports daily versus 33 (15.7%) from the private. The difference between the two groups regarding physical activity was statistically significant P ≤ 0.001. In contrary, pupils from private schools engaged significantly more in nonphysical activity, 150 (71.4%) and 34 (16.2%) of them watch television and play computer game daily as against 122 (58.1%) and 20 (9.5%) from the public schools, respectively, for television and computer games. Again the difference regarding nonphysical activity was significant P ≤ 0.001. 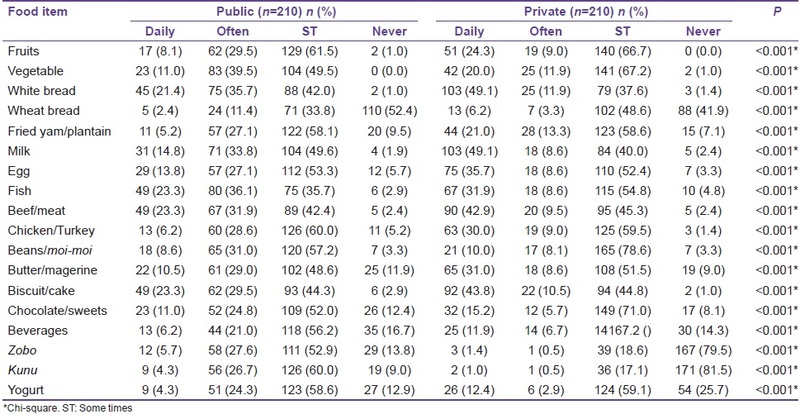 [Table 3] shows the distribution of the study population by BMI percentile. The nutritional status varied significantly between the pupils from the public and private school. While undernutrition was the predominant form of malnutrition in the public schools 33 (15.7%), overweight/obesity predominated in the private schools 57 (27.1%). The overall prevalence of overweight/obesity is 17.4%. 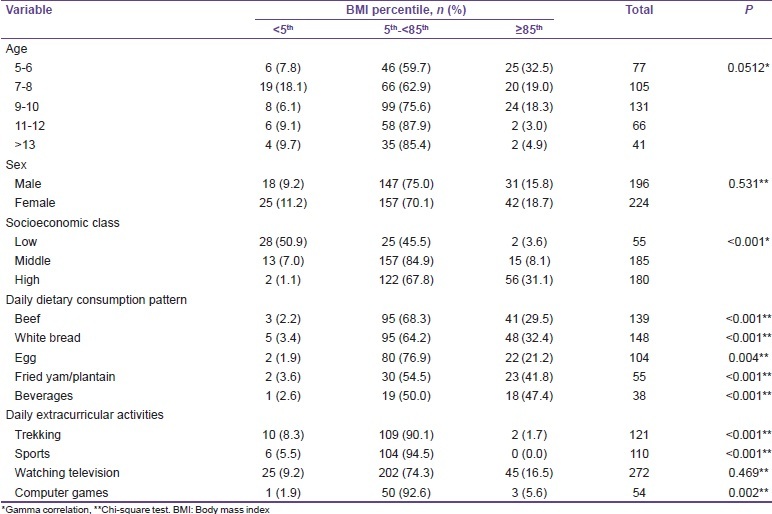 [Table 4] shows the effect of various studied variables on BMI percentile. The highest frequency of overweight/obesity was observed among those aged 5-6 years whereas the least frequency was among those aged 11 and above. This pattern was however not statistically significant (P = 0.05). Although more female pupils, when compared to male pupils, were found to be overweight/obese, this was not statistically significant. More than half (50.9%) of the pupils of low socioeconomic class were undernourished, whereas the majority of overweight/obese children (76.7%) were of high socioeconomic class. This relationship showed a strong positive correlation between these two variables (P ≤ 0.001). Daily consumption of selected high-calorie food items was associated with significantly higher frequencies of overweight/obesity when compared to other pupils who do not consume such food items regularly. In contrast, physical activity was associated with significantly low frequency of overweight/obesity. In contrast to the developed countries where overweight/obesity is more common among the low socioeconomic class, ,,] majority 56 (76.7%) of these overweight children in this study were of high socioeconomic class. This pattern is similar to findings from other studies from other developing countries. ,,, This fact was further confirmed by the significantly higher prevalence of overweight/obesity among pupils from private schools compared to those from public schools. In Nigeria, private schools, particularly in the urban centers, charge exorbitant fees affordable only to the rich while public schools are usually free and attended by the low socioeconomic class. In this study, 83.8% of the pupil in private schools were of high socioeconomic class as against 1.9% of those in public schools. Several factors could be responsible for this high prevalence of overweight/obesity among the affluent class in the developing countries. In the first place, the parents of these children are likely of the working class with little or no time to plan and prepare healthy food for them. It is also known that such parents in an effort to compensate for the deficient care constantly provide junk food and snacks for these children. Nutritional habits and patterns have been shown to influence the nutritional status of the society. These are further driven by aggressive advertising practices, relatively low cost of energy-dense food, and improved purchasing power which are now most prevalent in developing countries and leading to the development of overweight and obesity and subsequently the associated morbidities. This is in agreement with the finding in this study from Lagos, the most urbanized State in Nigeria, in which children from the private schools and of high socioeconomic status significantly consumed food of high energy density, such as soft drink, egg, white bread, when compared to those from the public and low socioeconomic status. Sedentary lifestyle has been well-documented as a cause of overweight and obesity ,, in children. Pupils from the private schools were significantly less involved in physical activities when compared to those from the public schools but engaged more in indoor activities such as television watching and computer games. Similar to previous studies, this practice was significantly associated with overweight and obesity. The low level of physical activity among those in private schools could be due to several reasons. Most of these children are either driven in car to school by their parents or use the school bus. This is in contrast to the public school where more than half (53.9%) of the pupil trekked to school daily as observed in this study. Second, while most public schools are usually sited in a planned location with enough space for sporting activity, the same cannot be said for the majority of the private schools in Nigeria where over 70% of private schools were found to be sited either in private homes or a makeshift buildings with no capacity for expansion. Pressure on the pupils from affluent society for good academic performance including regular extra lessons at home after school hours could also contribute to lack of outdoor activities at home. In this study, overweight/obesity was higher among the younger age groups compared to the older pupils with the highest prevalence of 18.2% among those aged 5-6 years. However, this relationship was not statistically significant. Similar pattern of decreasing prevalence with advancing age among children <13 years was also observed in a study from India  and Saudi Arabia. However, other studies have found a contrary pattern: Increasing prevalence with advancing age. The reason for this variability in finding is not clear. Females had slightly higher prevalence of overweight and obesity when compared to the male though this difference was not significant. This is similar to the finding of Mohan et al. from India. The effect of gender on overweight and obesity in children remains inconclusive whereas several studies have found significantly higher prevalence among the female gender, ,,, others have reported the reverse. ,, The reason for this variability is not clear, but studies with higher female prevalence have suggested cultural factors as a possible explanation as female children in certain society mostly engage in indoor activities. The prevalence of overweight and obesity among children living in urban centers in developing countries, such as Nigeria, is quite high and is comparable to that in the developed country. This problem is mainly a problem of children from high socioeconomic status. Dietary pattern and sedentary lifestyle are important factors contributing to the high prevalence among this group of children. In contrast, undernutrition has remained a major problem among the middle socioeconomic status. We recommend the introduction of school meal program in both the public and private school to augment calorie intake among the public school children and modulate same for those in private schools. Provision of sporting facilities must be made mandatory requirement for registering of private school and if already a requirement must be enforced on new and existing private schools. Finally, public nutritional education and campaign on the medical implications of overweight/obesity in children should be aggressively pursued by the relevant agencies before the complications begin to set in. Florêncio TM, Ferreira HS, de França AP, Cavalcante JC, Sawaya AL. Obesity and undernutrition in a very-low-income population in the city of Maceió, Northeastern Brazil. Br J Nutr 2001;86:277-84. Pai M, Alur M, Wirz S, Filteau S, Pagedar S, Yousafzai A. A pilot study of the nutritional status of disabled and non-disabled children living in Dharavi, Mumbai. Indian Pediatr 2001;38:60-5. Krebs NF, Primak LE. Pediatric undernutrition. In: Marcdante KJ, Kliegman RM, Jenson HB, Behrman RE, editors. Nelson Essentials of Pediatrics. 6 th ed. Philadelphia: Saunders; 2011. p. 111-3. Schaible UE, Kaufmann SH. Malnutrition and infection: Complex mechanisms and global impacts. PLoS Med 2007;4:e115. Neumark-Sztainer D, Story M, Hannan PJ, Croll J. Overweight status and eating patterns among adolescents: Where do youths stand in comparison with the healthy people 2010 objectives? Am J Public Health 2002;92:844-51. Wang Y, Beydoun MA. The obesity epidemic in the United States - Gender, age, socioeconomic, racial/ethnic, and geographic characteristics: A systematic review and meta-regression analysis. Epidemiol Rev 2007;29:6-28. Ogden CL, Lamb MM, Carroll MD, Flegal KM. Obesity and socioeconomic status in children and adolescents: United States, 2005-2008. NCHS Data Brief 2010;51:1-8. Owa JA, Adejuyigbe O. Fat mass, Fat mass percentage, body mass index, and mid-upper arm circumference in a healthy population of Nigerian Children. J Trop Paediatr 1997;43:13-9. Lobstein T, Baur L, Uauy R; IASO International Obesity TaskForce. Obesity in children and young people: A crisis in public health. Obes Rev 2004;5 Suppl 1:4-104. Adegoke SA, Olowu WA, Adeodu OO, Elusiyan JB, Dedeke IO. Prevalence of overweight and obesity among children in Ile-ife, south-western Nigeria. West Afr J Med 2009;28:216-21. Alkali YS, Ambe JP, Sabin M, Zacharin M. Socio-economic status, lifestyle and childhood obesity in Gombe. Niger J Paediatr 2015;42:107-10. Mendez MA, Monteiro CA, Popkin BM. Overweight exceeds underweight among women in most developing countries. Am J Clin Nutr 2005;81:714-21. Zhang YX, Zhao JS, Chu ZH. Prevalence of overweight and obesity among children and adolescents is associated with urbanization in Shandong, China. Int J Cardiol 2014;176:1212-3. Ojiako IA, Manyong VM, Ikpi AE. Determinants of nutritional status of preschool children from rural household in Kaduna and Kano States, Nigeria. Pak J Nutr 2009;8:1497-505. Daniels SR. The consequences of childhood overweight and obesity. Future Child 2006;16:47-67. National Population Commission of Nigeria. 2006 National Population Census. Maiduguri, Nigeria: National Population Commission of Nigeria; 2006. Ogunlesi TA, Dedeke IO, Kuponiyi OT. Socio-economic classification of children attending Specialist Paediatric Clinic in Ogun State, Nigeria. Niger Med Pract 2008;54:21-5. Centers for Disease Control and Prevention/National Center for Health Statistics. 2000 CDC Growth Chart for the United States: Methods and Development. Vital and Health Statistics, Series 11, No. 246; 2002. Mogre V, Abukari RN. Overweight, obesity and thinness and associated factors among school aged children (5-14 years) in Tamale, Northern Ghana. Eur Sci J 2013;9:160-75. Ogden CL, Carroll MD, Kit BK, Flegal KM. Prevalence of childhood and adult obesity in the United States, 2011-2012. JAMA 2014;311:806-14. Premanath M, Basavanagowdappa H, Shekar MA, Vikram SB, Narayanappa D. Mysore childhood obesity study. Indian Pediatr 2010;47:171-3. El-Hazmi MA, Warsy AS. The prevalence of obesity and overweight in 1-18-year-old Saudi children. Ann Saudi Med 2002;22:303-7. Dinsa GD, Goryakin Y, Fumagalli E, Suhrcke M. Obesity and socioeconomic status in developing countries: A systematic review. Obes Rev 2012;13:1067-79. Manson JE, Skerrett PJ, Greenland P, VanItallie TB. The escalating pandemics of obesity and sedentary lifestyle. A call to action for clinicians. Arch Intern Med 2004;164:249-58. Popkin BM. The nutrition transition and obesity in the developing world. J Nutr 2001;131:871S-3S. Misra A, Khurana L. Obesity and the metabolic syndrome in developing countries. J Clin Endocrinol Metab 2008;93 11 Suppl 1:S9-30. Gupta N, Goel K, Shah P, Misra A. Childhood obesity in developing countries: Epidemiology, determinants, and prevention. Endocr Rev 2012;33:48-70. Kuriyan R, Bhat S, Thomas T, Vaz M, Kurpad AV. Television viewing and sleep are associated with overweight among urban and semi-urban South Indian children. Nutr J 2007;6:25. Al-Hazzaa HM, Al-Rasheedi AA. Adiposity and physical activity levels among preschool children in Jeddah, Saudi Arabia. Saudi Med J 2007;28:766-73. Agi UK. The challenges and prospects of managing private school system in River State. Afr Res Rev 2013;7:340-51. Misra A, Shah P, Goel K, Hazra DK, Gupta R, Seth P, et al. The high burden of obesity and abdominal obesity in urban Indian schoolchildren: A multicentric study of 38,296 children. Ann Nutr Metab 2011;58:203-11. Mohan B, Kumar N, Aslam N, Rangbulla A, Kumbkarni S, Sood NK, et al. Prevalence of sustained hypertension and obesity in urban and rural school going children in Ludhiana. Indian Heart J 2004;56:310-4. Wasir JS, Misra A. The Metabolic Syndrome in Asian Indians: Impact of nutritional and socio-economic transition in India. Metab Syndr Relat Disord 2004;2:14-23. Armstrong ME, Lambert MI, Sharwood KA, Lambert EV. Obesity and overweight in South African primary school children - The Health of the Nation Study. S Afr Med J 2006;96:439-44. Jabre P, Sikias P, Khater-Menassa B, Baddoura R, Awada H. Overweight children in Beirut: Prevalence estimates and characteristics. Child Care Health Dev 2005;31:159-65. Tee ES, Khor SC, Ooi HE, Young SI, Zakiyah O, Zulkafli H. Regional study of nutritional status of urban primary schoolchildren 3. Kuala Lumpur, Malaysia. Food Nutr Bull 2002;23:41-7. Wickramasinghe VP, Lamabadusuriya SP, Atapattu N, Sathyadas G, Kuruparanantha S, Karunarathne P. Nutritional status of schoolchildren in an urban area of Sri Lanka. Ceylon Med J 2004;49:114-8.